Ganggu No-Dig Engineering company is the only no-dig contractor in the region of Tianshui County, Gansu Province, an underdeveloped province in the western region of China. They were subcontracted to drill a river-crossing bore with a maximum depth of 28 m and install 740 m of 457 mm steel gas pipe. Because both the depth and distance were a challenge for the job, DCI Field Service personnel provided a Falcon F5 guidance system. The strong capability of Falcon technology and its DataLog feature confirmed the contractor’s need for Falcon F5 on this job. The HDD market is still small in Gansu Province but the region is part of China's “one-belt-one-road” investment initiative (called the re-start of the old silk road). The challenges of the job were the stability of roll/pitch data at the depth of 28 m and how to locate over a river. After using the frequency optimizer to determine the best operating frequencies, they selected Band 38 for their 19-inch transmitter. After calibration, the Above Ground Range (AGR) test showed that the R/P data could reach 38 m.
Stable signals made locating and drilling easy except for part of the river crossing: it is hard to find locate points while sitting in a boat. Intermittent readings were available with the use of Max Mode and the bore was successfully completed in 16 hours. The contractor knew that a magnetic guidance system is usually required for such a deep bore, especially crossing water. They were very satisfied with the performance of Falcon F5 and the success of the pilot bore. *The above chart provides the as-built of the bore and the annular drilling fluid pressure measured during the pilot bore. 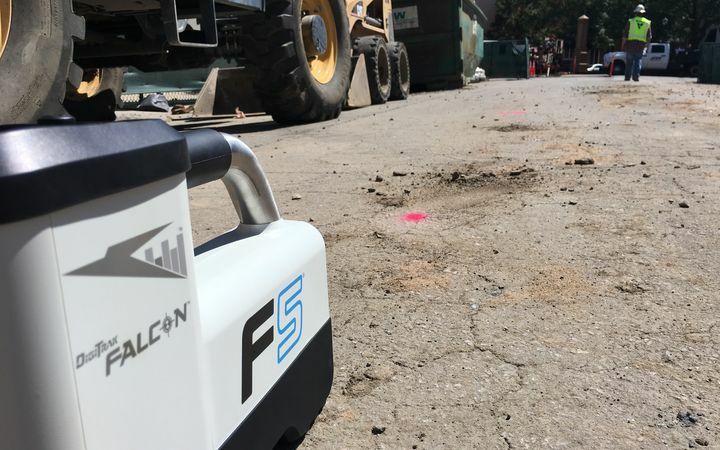 Learn how Falcon systems perform onsite.